Before he was shot dead by a sheriff’s deputy, the man calling himself “the Creator” pounded on a homeowner’s door, stabbing it with a knife, authorities said. 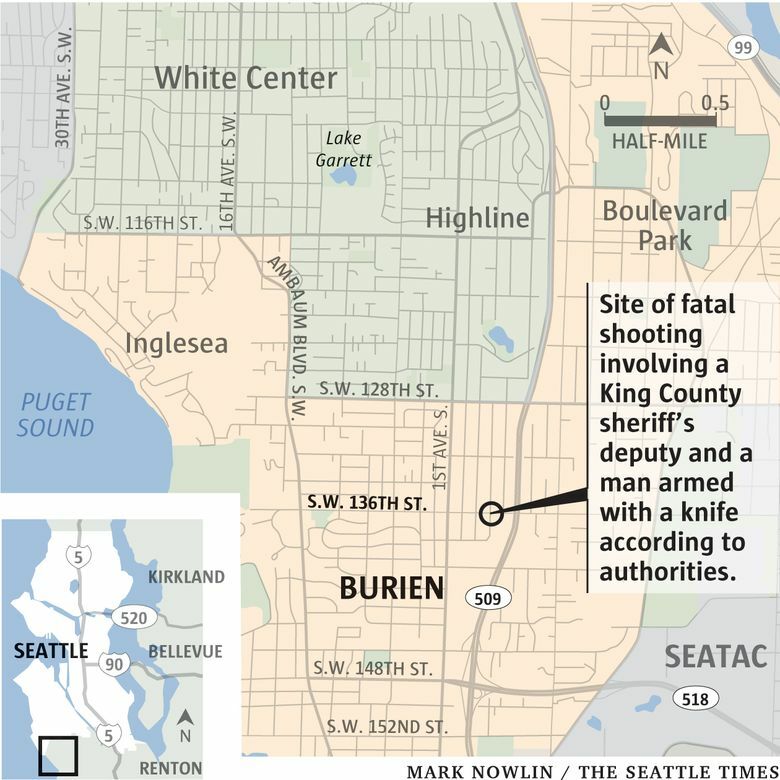 A King County sheriff’s deputy fatally shot a man who was pounding on a Burien homeowner’s door around midnight Tuesday, stabbing it with a knife and yelling that he was “the Creator,” according to a sheriff’s office spokesman. Sgt. Jason Houck said the office doesn’t know the name of the man, who had no identification on him. “We have nothing. Nobody in the neighborhood seems to know him,” Houck said. The homeowner was alerted to the man’s presence in the area when a friend came to his door, in the 13600 block of Third Avenue South, and yelled that someone was running after him with a knife, according to Houck and a sheriff’s office news release. The homeowner grabbed a handgun and went outside to see what was going on. He found the stranger coming after him. The homeowner fired a warning shot into the ground, but the man continued advancing. The homeowner ran back into his house and slammed the door just as the man was about to enter. That’s when the self-described “Creator” started stabbing the door, authorities said. Sheriff’s deputies arrived around that time. According to Houck, they ordered the man to drop to the ground. Instead, he advanced toward the deputies. They fired Tasers at him, but the man continued. One deputy fired a gun, hitting him in the torso. The man was taken to Harborview Medical Center in Seattle, where he died. The deputy who fired the shot has been with the sheriff’s office for 2½ years, and he has been placed on administrative leave.